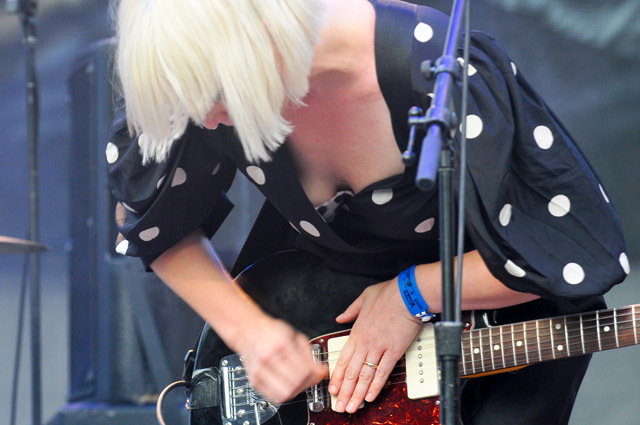 The Raveonettes at NXNE 2010. What to Bring: An open mind. Not every act you see will be earth-shattering, but sometimes a hidden gem opening for a couple of bigger names will leave an impression. It’s sifting through the talent that provides so much of the enjoyment at a festival like this. Where to Go: The biggest no-brainer would be to catch the free Flaming Lips show at Yonge-Dundas Square on June 16 (9 p.m.). Expect confetti cannons, folks in dancing animal suits, and a good possibility of Wayne Coyne walking across the crowd in a giant bubble. Oh, and be sure to get there early for Of Montreal, who are, in fact, from Georgia (7 p.m.). Or, pop into the Horseshoe on June 14 for Hooded Fang (10 p.m.), the El Mocambo on June 15 for Paper Lions (midnight), or watch Goodnight, Sunrise close the fest down on June 17 at Rancho Relaxo (10 p.m.). Dos and Don’ts: When the occasion calls for it and the music all but demands it do take the opportunity to move those dancing feet. But in those quiet moments between songs, don’t be that guy who shouts out requests for “Free Bird.” Just kidding, keep doing that.